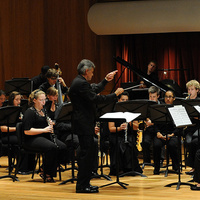 The University of Louisville Wind Symphony is widely known for its persuasive performances of significant works representing a variety of styles in the wind band repertoire. Directed by Dr. Frederick Speck, the musicians aspire to the highest level of musical and artistic standards. The ensemble maintains an active schedule of performances and is comprised of the finest woodwind, brass, and percussion students at the university. In addition to campus performances, the ensemble has been invited to perform at numerous professional association conferences. Such performances include Kentucky Music Educators Association In-Service Conferences, College Band Directors National Association-Southern Division Conferences, the Music Educators National Conference National Convention, the College Band Directors National Conference in New York City, World Association for Symphonic Bands and Ensembles Conferences in Killarney, Ireland and San Jose, California, the Jungfrau Music Festival in Interlaken, Switzerland and the American Bandmasters Association Convention. The WASBE Conference performance in Killarney was acclaimed as “Un tour de force enorme” (Miguel Etchegoncelay, Argentina), “ein Konzert der Superlative” (Peter Bucher, Switzerland) and as possessing “assertive musicality and powerful precision” by Chris Woodruff, USA. Also commenting was Timothy Reynish, World Association for Symphonic Bands and Ensembles, Past-President, who observed that Karel Husa’s “Cheetah … has to be played as brilliantly as this. Frederick Speck is a meticulous conductor, and the ensemble was on outstanding form, throwing Husa’s virtuosity off effortlessly… a concert which centered on the Grawemeyer composers Husa, Penderecki, Takemitsu and Joan Tower, and this was an intriguing, brilliantly played and conducted programme. Now in their eleventh season, the musicians of the Louisville Concert Band and Chamber Winds Louisville enjoy sharing their enthusiasm for the performance of wind repertoire in all of its dimensions. Concerts typically include chamber music, solos with the ensemble, and full-cast concert band works. The repertoire is diverse, spanning harmoniemusik to the most current new works, and often including at least one piece by a composer of whose contributions have a special place in the development of the wind band (Mennin, Creston, Persichetti, Grainger, Sousa, Fillmore, and others). The integration of full ensemble with chamber pieces brings great variety to the repertoire and keeps the listener engaged in the concert event. Frederick Speck, the director, is surrounded by ensemble members who are educators (both in music and other disciplines), professional musicians, and other excellent performers whose professions are in non-music fields. All are drawn together because of their appreciation for the fellowship of ensemble performance and the joy of sharing it with appreciative audiences. In addition to regular season concerts, the ensemble has performed at the 2011 Kentucky Music Educators Association Conference and the 2013 Midwest Clinic: An International Band and Orchestra Conference.